Beyond 1080p doesn't mean 4K. Microsoft and Sony have finally announced their new, more powerful console revisions. The PS4 Pro and Project Scorpio promise a significant performance bump over their current-gen counterparts, supposedly ushering in the era of 4K console gaming. Although we will see some 4K games, it's likely that neither console has the power to pull off the higher resolution without compromise. We've heard this story before. When the Xbox 360 was unveiled at E3 in 2005, it was supposed to play games at a crisp 720p or 1080i. The following year, when Sony announced the PlayStation 3, it did so by showing off Gran Turismo HD running at a native 1080i/60, with the promise of 1080p games to come. For the most part, that didn't happen. Instead, many Xbox 360 games upscaled just to hit 720p. The significantly more powerful PS3 also stuck mostly to 720p, with a smattering of 1,280 x 1,080 games (which were then processed to stretch out the horizontal resolution). To my memory, the only 1080p game I had on PlayStation 3 was Fifa Street 3 (I make bad life choices). Oh, and Gran Turismo 5: Prologue let me see my garage (and only my garage) in 1080p. Then came the current console generation and the pitch of true 1080p gaming. Very quickly, that promise unraveled. Xbox One launch titles like Ryse (900p) and Dead Rising 3 (720p) fell short, with only Forza Motorsport 5 hitting 1080p at the expense of anti-aliasing and texture quality. PlayStation 4 titles fared a little better: Infamous Second Son, Killzone Shadow Fall and Knack hit 1080p. But all three games suffered from serious frame-rate issues: Killzone developer Guerrilla Games was forced to add a 30fps lock to the single player through an update and faced a (failed) lawsuit when it was discovered the "1080p 60fps" multiplayer actually ran at 960 x 1,080 and pixels doubled using "temporal reprojection." The biggest cross-platform title of the launch window, Ubisoft's Watch Dogs, hit 792p on Xbox One and 900p on PlayStation 4. Both versions relied on adaptive v-sync (a trick that minimizes stuttering when frames aren't rendered in time) just to stick to 30fps. Things have improved a little since then, as developers now understand the consoles' respective limitations. We now see some 1080p games that mostly stick to 30fps, with exclusive titles Rise of the Tomb Raider on Xbox One and Bloodborne on PlayStation 4 being prime examples. Even so, the vast majority of titles struggle, with shooters relying on dynamic scaling to hit 60fps and other games sticking with 30fps caps just to get by. There are outliers, of course: Lots of last-gen remasters are hitting the holy grail of 1080p and 60fps (1080p60). And some games -- like Forza Motorsport 6 on the Xbox One and Metal Gear Solid V: The Phantom Pain on the PS4 -- run almost entirely at 1080p60. With this historical knowledge in mind, it's unlikely that either of the new consoles will hit 4K frequently. From what we know of Scorpio, the PlayStation 4 Pro is by far the least powerful of the two. It features a refreshed AMD Jaguar CPU with a higher clock speed and a new Polaris GPU with 4.2 teraflops of potential power. That's a big improvement over the original PS4's 1.84 teraflops GPU, but it's not enough to hit 4K without some serious compromises, or, as will be more common, upscaling tricks. Sound familiar? First-party titles shown off at yesterday's PlayStation Meeting included Horizon: Zero Dawn, Days Gone and Infamous First Light. None of them are close to hitting 4K. Instead they all rely on advanced checkerboard upscaling, which by all accounts looks fantastic when compared to 1080p. The only confirmed native 4K (rendering at 3,840 x 2,160 with no tricks) game we've heard of is Elder Scrolls Online, which apparently manages to maintain a lock of 30fps. For perspective, ESO is not graphically intensive and will run just fine at 1080p on a three-year-old gaming laptop. Naughty Dog, for its part, says it'll have The Last of Us (a game that debuted on the PlayStation 3) optimized to run at 1080p60 with "improved performance" or 4K at 30fps. We've seen no evidence that Call of Duty: Infinite Warfare will be able to pull off 4K 60fps, despite some vague onstage claims to that effect. Activision has a history of dynamically scaling resolution to keep CoD frame rates steady, and it's likely we'll see that tactic in play again. And that 4K slice of Mass Effect: Andromeda? It was deliberately chosen because of its sparse environment and extremely dark setting. Even with these tricks, performance expert Digital Foundry suggests jaggies are evident on close inspection, and it's highly likely Bioware will upscale the final game, dynamically or otherwise, from a lower resolution than 4K for the PS4 Pro. True 4K on the PlayStation 4 Pro, then, is not impossible but extremely improbable beyond a few highly optimized titles and remasters. But what about Project Scorpio? Microsoft will throw an all-new, 8-core CPU in its console to end all consoles, along with a GPU capable of 6 teraflops and 320GB/s memory bandwidth. Microsoft claims this will enable "true 4K" gaming. Again, though, its utilization seems improbable. You only need to look at the state of 4K gaming on PCs to see why. The Nvidia GTX 1070 -- a $380 6.5 teraflop card with 256GB/s memory bandwidth -- paired with a top-of-the-range Intel i7 processor can just about pull off 4K gaming. By "pull off," I mean that while averages above 30fps are common, you'll regularly see sub-30fps drops from demanding games. Despite its increased specs over the Xbox One, Project Scorpio is unlikely to significantly outmuscle that setup. Drop that 4K resolution down to 1080p, however, and the GTX 1070 comes into its own, achieving plus-60fps rendering even with maxed-out graphical settings. At 1440p -- a favorite resolution among PC gamers -- the Scorpio is likely to shine, offering solid frame rates and a significant improvement in fidelity over 1080p when stretched over a large 4K TV. We don't know enough about Scorpio yet to make definitive statements. Its memory bandwidth (and the 10 to 12GB of video memory it implies) is large and will help out with 4K. Developers can optimize for Scorpio more than they can for individual PC setups, although they'll also have to be targeting the vanilla Xbox One concurrently. But even the GTX 1080, a $600, 9-teraflop card, struggles with frame rates at 4K. I wouldn't be surprised to see Project Scorpio launch with the option to play some games at 4K30. Microsoft could even decree that all games need to hit that target. But even if it does, it's far more likely that performance-obsessed gamers -- the obvious target market for Microsoft's new console -- will want 60fps games at the highest fidelity possible. Rendering at 1440p and similar resolutions will still offer noticeable improvements on a 4K TV set. And if you have a 1080p set, you're going to see 60fps as well as some additional graphical accoutrements. Until Scorpio is released, Sony can safely claim that the PS4 Pro will offer the best-looking console games ever. Games that dynamically scale, or use the checkerboard process to upscale, will look better than their current-gen counterparts. Games that run at 1080p will be able to perform at a consistently higher level than they do on the PS4. We should never again see a 1080p title dropping below 30fps, and indeed, the vast majority should run at 60fps. That's fantastic news. It's good that Sony and Microsoft are updating their consoles to support 4K TVs, which have moved from niche, expensive products to practically the norm on electronic store shelves. Lots of gamers -- many of them the companies' most fervent supporters -- already have 4K sets, and within the next few years it's probable that millions will be investing in 4K. What's not good is selling gamers on the promise of "4K gaming." Console gamers were sold the lie of 1080p gaming for many years, and developers' desire to satiate fans -- who only wanted 1080p gaming because they were promised it -- has resulted in high-resolution, low-performance gaming becoming the norm. As someone with a 1080p TV and no intention to upgrade to 4K in the immediate future, I'm genuinely excited about both consoles. But I wish we could get a clear idea of what they can and can't do. With the PS4 Pro, Sony needs to be up front about the console's (lack of) 4K capabilities. It's fine if your console can't do 4K gaming with any regularity, but don't say that "PS4 games deliver unprecedented visual precision, such as 4K quality resolution to give remarkable clarity down to the tiniest detail" on your website. Be honest. Tell gamers that their games will look and play better on both 1080p TVs and 4K TVs. Tell them this is the best they'll get on a console right now. They'll still buy the thing. Microsoft has some time to think. 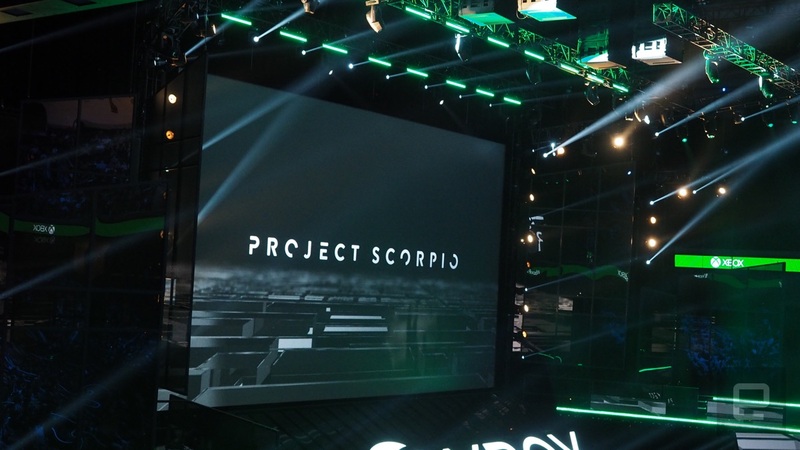 Project Scorpio isn't likely to be unveiled properly until E3 next year. Unless it truly believes that games running at 4K will be the norm -- and, hey, maybe it can somehow pull off 4K30 across the board -- it should shy away from that marketing spiel. Given the significant performance increase between the PS4 Pro and Scorpio, it should stick with a far simpler line: "No matter what TV you own, games will look and perform better on our console than a PS4 Pro." Add in VR and (almost certainly) UHD Blu-ray support and that's likely a winning formula, provided the price is right, of course. Find all the news from Sony's big PlayStation event right here.